Last year, Matt Huff walked the hillside behind the Southeast Portland church he pastors and found a couple living in a tent. Instead of calling the cops, he built the homeless couple a cottage. 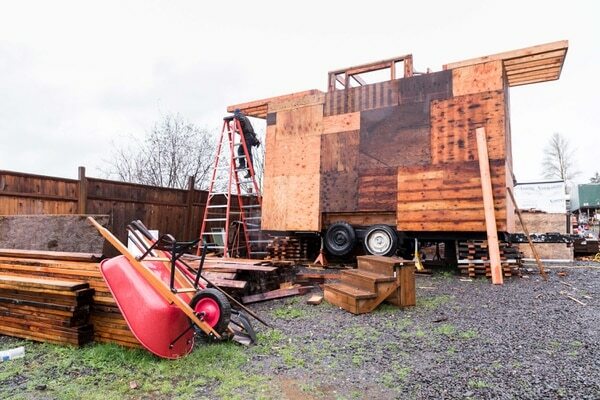 In fact, he and the parishioners at Portland Central Church of the Nazarene decided to build 15 wooden tiny homes on 11 acres of church property beneath Kelly Butte. For at least two mayoral terms, Portland city officials have talked about churches providing car camping and cottages for people living on the streets. This site, called Agape Village, is the first and largest effort by a faith-based organization in this famously irreligious city. Already, more people have applied for spaces than the church can provide, and Huff has stopped taking applications. "It started with just trying to figure out what it looks like for us to love God and love our neighbor," he says. "Our neighbors are sleeping in tents, very literally." 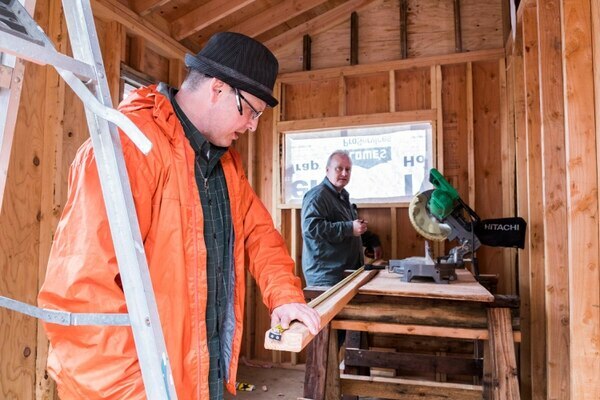 The church has 13 of the tiny homes built and expects to finish the other two by mid-June. The structures, each 96 square feet, meet the typical definition of a tiny home, except they don't have plumbing or running water. (Residents will share portable toilets and a shower.) 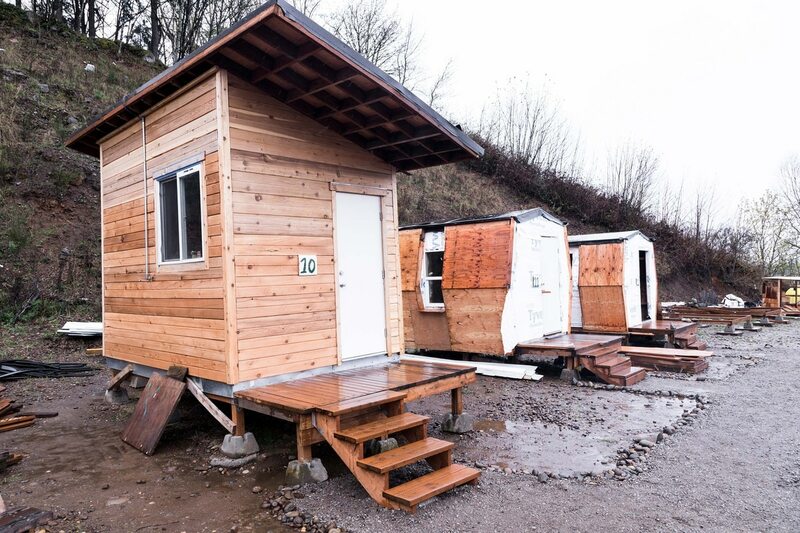 Organizers call the structures "pods"—and say they're not designed as permanent housing but as temporary shelter. But Huff isn't kidding himself—in a city where 110 homeless camps are reported to government officials every week, some of the pods' residents will be staying. "There's one gentleman we're working with that I full-on expect, if he moves in, it will probably be his forever home," says Huff. The pods are relatively easy to build. The materials cost about $5,000 per unit. The labor at Agape is mostly volunteer. What was tricky: finding an exemption from the city's system development charges—fees levied on any construction project. "I didn't get taught in seminary how to go through permit stuff with Portland," Huff says. The permit process and the cost, he adds, "could be a deal breaker for a lot of churches if they wanted to do that." Sandra Comstock, a founder of Neighbor2Neighbor, a data and policy group, thinks it's time the city fixes its zoning policies to encourage churches to follow Huff's example. "I think it's time we did a zoning overhaul and made space for these kinds of projects," says Comstock. "There is a huge obstacle in which city and state laws make it very difficult to create villages like Agape." In December 2018, Mayor Ted Wheeler's office pushed successfully to begin waiving the development charges for all shelters and short-term housing in cases where groups are working with the Joint Office of Homeless Services. That office is working with the city to make the process easier to navigate. "We are working to create a simpler process for helping community partners create waivers," says spokesman Denis Theriault. But the problem isn't going away. The number of public complaints about street camping has risen to more than 600 a week, up from about 90 a week when Neighbor2Neighbor started tracking data in March 2017. Not everyone welcomes the village. Timothy Crawley, president of the Powellhurst-Gilbert Neighborhood Association, says he doesn't think his neighborhood is equipped to handle the arrival of marginalized people who need social services as well as shelter. "Should we really be housing more folks at this point when there is a significant inequity in the city? East Portland neighborhoods have faced this kind of discrimination for a long time," says Crawley. He'd rather see Powellhurst-Gilbert receive more policing: "The police should be central in this process. We need to understand and recognize the need for our police officers to do what they have to do in order to keep our families safe." Huff hopes to see other churches in the city take their cue from the Church of the Nazarene, because he's not optimistic government can address homelessness. "The problem with the city trying to address the issue," Huff says, "is the bureaucracy that exists within the city government, which is probably why the church, as a private entity, is going to have better success and an easier time doing it."